Last month I learned how shot my climbing legs can get after racing the Cayuga Trails 50 and then attempting Mt. Washington a mere 7 days later. Let’s just say that 2 miles into the 7.6 mile race up the auto road in the White Mountains New Hampshire I was in a world of hurt and already a good 30 seconds off my pace from last year on “the big hill.” Lesson learned. So I’ve been racing a lot this year…(probably waaay too much). But for me racing is a big driving force of my running and I do train specifically for races a lot of times with prize money in mind as I do use my legs to pay the bills and rent! But I also love running for the sake of running. I love the camaraderie and I love the competition. I love the process of setting a goal and chasing it; the sense of accomplishment derived from self-improvement. 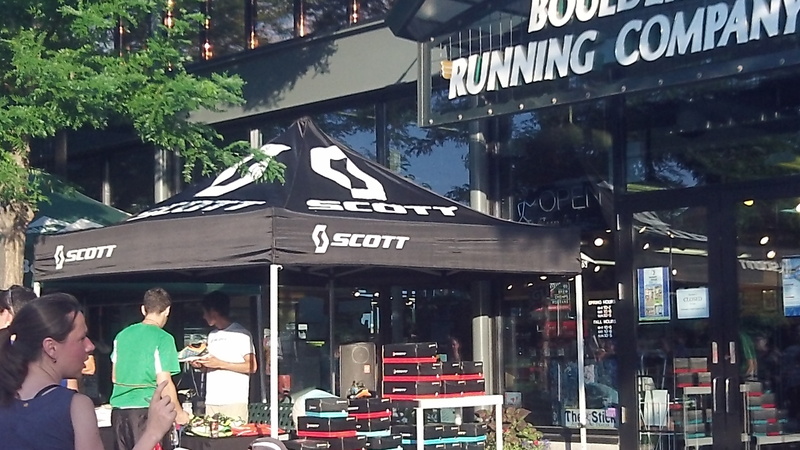 Working a shoe demo night at the Boulder Running Company store. Big turn out for the group run!! In closing, here is a 7-day snapshot of my prep for Speedgoat. (Note: I chose a week going from Saturday to Friday because it happened look the best on my training log…lots of people count their weeks from Sunday to Saturday or Monday to Sunday but I wanted this total to look higher than my usual weekly mileage!). It’s not about any given 7-day block of training anyway – it’s about weeks and weeks and months and months and years and years of training, appropriate periodization and desired adaptation. Where I grew up running trails..in the woods of Oregon. Sandi with my dog. 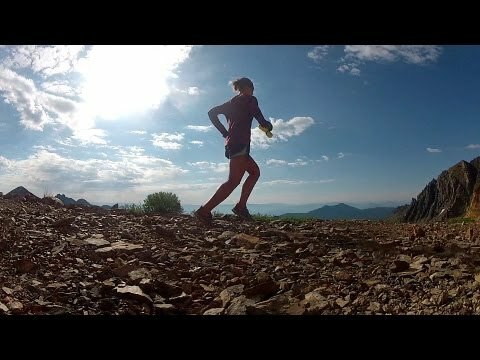 7-9-13: Easy 14 miles in Snowbird, Utah with Sandi (trying to find the speedgoat 50k course!) 4,065’ of vert. 3hrs, 19min. 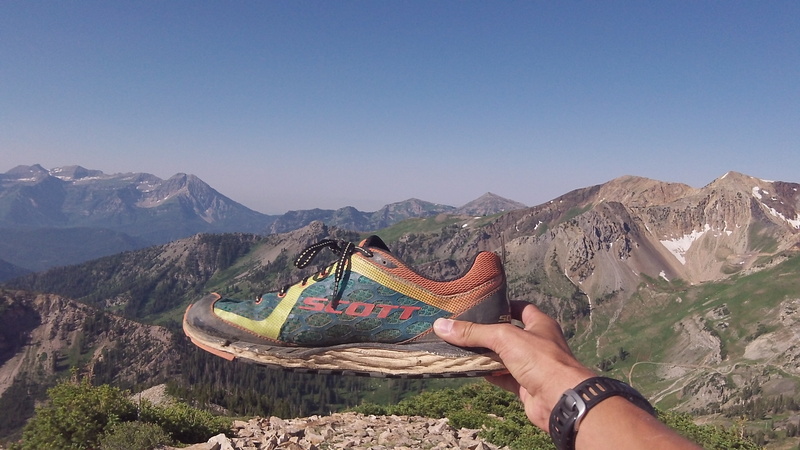 The SCOTT Kinabalu trail shoe made the climb up over 11,000 feet! 7-10-13: Easy 12 miles on S. Boulder Path. 1hr25min (7:05 pace ave.). Keeping things pretty flat with 354’ of vert. 7-11-13: Longish: 20 miles in 2hrs57min. 4272’ of vert. Started way too late and the heat of the day in Boulder was brutal! Tagged Bear and went over to South Boulder Peak for the first time…then down Bear Canyon and over on Mesa trail. Didn’t bring enough fluid and went a good hour without drinking…still able to roll some 6min miles on the road at the end. 7-12-13: Semi-long: 16 miles on Niwot ridge over to Sourdough trail. 2hrs 10min, with 2552’ of vert. Felt decent climbing up the ridge and hit close to 11,500’ of elevation. 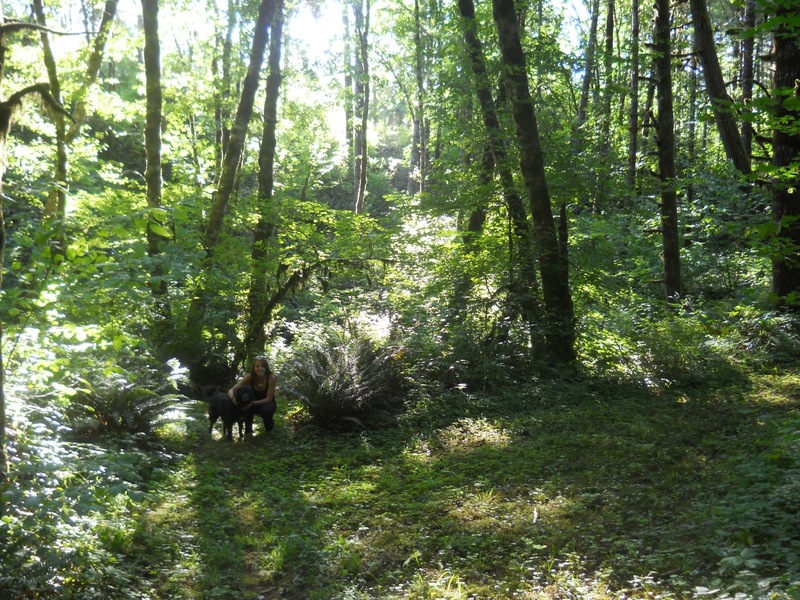 As you can see from the pictures/locations Sandi and I hit up a lot of trails, drove from Colorado to my home in Oregon where we ran in the forest near the coast. On our drive back we even slept in our car outside of Salt Lake city and then got hopelessly lost trying to find the Speedgoat course. I’ve made a conscious effort to get in more vertical as that was what I felt I was seriously lacking strength in at Transvulcania. I should also note that it was a somewhat rough week for Sandi and I as our trailer/cabin up in Nederland had some serious plumbing issues and we were without a bathroom, shower, and easy access to potable water for a couple days. Running has been good to us so far though! view of the Oregon coast. Sandi and I ran up this dune a couple times! Looking forward to meeting you at SG Sage. Wondering also if you’d at all be interested in a quick sit down on-camera interview w/ me afternoon before (Friday) if you get a couple of minutes. E-mail me if interested. Best of luck in the remaining couple of weeks (gulp!). Hey likewise! Thanks – I’d be up for a video interview. Hopefully Bryon of iRunFar will be there as well so look for me around the media/interview area…I’ll be wearing SCOTT gear! Thanks. 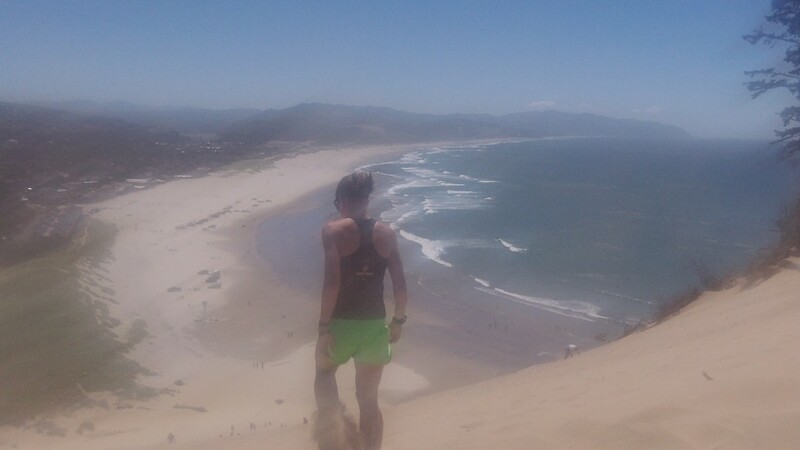 Hey Sage, where is that Oregon sand dune? Is it anywhere near Seaside? Best of luck at Speedgoat! Hey thanks! It’s out in Pacific City, Oregon…about 20 min north of Lincoln City I think. Seeing that pic of the Oregon coast makes me miss my Oregon stomping grounds as well. Looking forward to getting out there the second half of Sept if plans work out. Thanks for the nice update and wish you well at Speedgoat! hey thanks CJ! Oregon is great in the summer/fall! Hope you get a great trip out there. Thanks for the support!! Good luck at Speedgoat Sage! I talked with you a bit after UROC last year (when you were recovering sitting on the curb). It’s great to be able to talk to the top guys at the ultra races even though I’m just a mid pack runner. I’ll be checking in on your site more often to see how you’re doing. By the way, I just downloaded the song from your “running in the mountains of New Hampshire” video (You are the Moon). My girlfriend was listening to it while I was watching the video and she said that we should get it. Not sure if the song was your choice or Sandi’s, but it’s a great song! ps. Give Max some Hell this weekend! Thanks for your message! I hope i wasn’t too out-of-it after UROC last fall (that was a very painful first 100km for me!). Glad you liked the song in the video – it was actually my choice although Sandi had listened to it before I think. We basically need to just search Jamendo for free music and hope that it stays copyright free so we don’t get in trouble with YouTube. Thank you again for the well wishes and best of luck with your training and future races!